Ten of our students attended the Paris MUN weekend conference between the 13th and 15th February, accompanied by David Lewis (AGESSIA co-secretary) and Christine Balansard (AGESSIA parent). At this annual simulation of the United Nations, each student (Premieres and Terminales) was designated a committee after selecting a country he/she was interested in discovering and representing in this forum (please see below for those who took part). For two days our delegates debated clauses (in order to form resolutions) and then voted on these clauses (and on any amendments to them) and ultimately on the resolutions arrived at. Topics ranged from ‘Narco-trafficking cartels in Latin America’ (Disarmament committee) to ‘Boko Haram and the threat it represents to international security’ (Political committee). Two of our delegates participated in the Climate Change committee (working on the post-COP21 Paris Agreement) which comprised 150 delegates – the largest committee assembled – and the venue for this was the Bernadins, a beautiful renovated medieval monastery. Also this year, Lycée Duby was delighted to be represented on the Security Council which is always limited to 15 delegates. Topics discussed in the SC were ‘Peace building in post-conflict zones’ and ‘The situation in Yemen’. The main conference venue was the Palais de la Mutualité, ‘round the corner’ from the monastery. As well as hosting the majority of committees, staff at the Palais’ served much needed coffee and croissants during the breaks ! 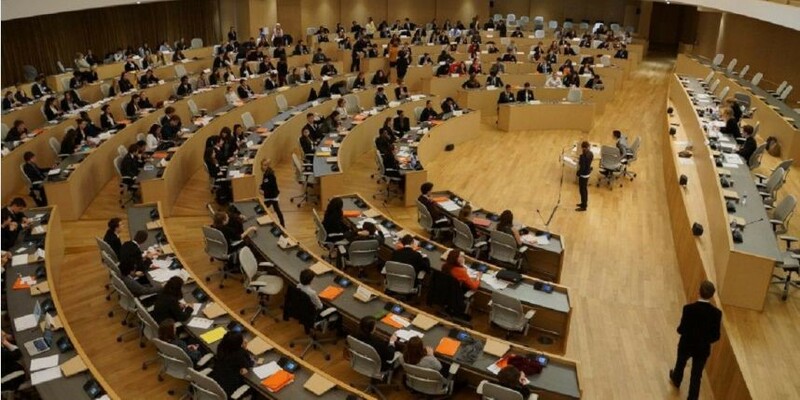 On Monday morning, all 570 delegates (from all over the world, including schools in China, India and Spain) gathered together for the General Assembly debate on ‘Measures to address Europe’s refugee crisis’. A BIG thank you then to Mme Balansard for all her help and support during the weekend and also to Mme Chavane (AGESSIA treasurer) for researching and then booking such a well run and welcoming hotel. Thank you too to all our students whose engagement was impressively mature and whose company was delightful, be it around the conference venues or during our evening meals at the Chinese and Indian restaurants near our friendly hotel in the 5th arrondissement. Paul BERNARD (Angola on Disarmament Committee), David DOCHY (Kuwait : ECOSOC), Adrien LEGRIS (Angola : Security Council), Chloe LEMARECHAL (Kuwait : Political), Camille MALERBE DERAM (Angola : Special Conference on Climate Change), Thomas MORENO (Angola : Political), Sam JACKSON (Kuwait : Human Rights), Claire JANDA (Angola : Human Rights), Mathieu SACCHI (Kuwait : Special Conference on Climate Change), Noah TCHENIO (Kuwait : Disarmament).